On the early morning of May 12, 1864, the Confederate soldiers who had so hastily built earthen fortifications the night before in preparation for the morning’s battle were awakened by the deluge of rain. Unfortunately, their firearms were not (apparently black powder and water never mixed well). Quickly finding themselves amidst hand-to-hand combat with the enemy, the idea of seeing fire, whether on the ground or coming from the barrel of a gun, was far from a possibility. The historic field in Spotsy containing the iconic Bloody Angle was most certainly on fire today. 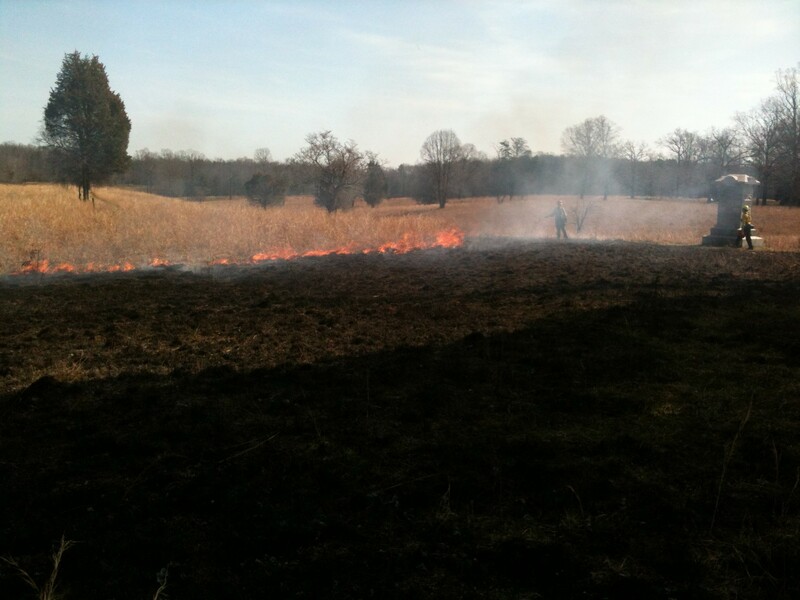 As part of the National Park Service’s plan to remove invasive species and to restore the cultural landscape, Fredericksburg and Spotsylvania National Military Park performed a prescribed burn on the Spotsylvania battlefield. Over half of the field once having been forested (it was cleared to its modern appearance in the early 1980’s), the ground covers old root stock, roots that tirelessly attempt to grow into trees year after year. Every Spring, these roots develop into saplings, littering the should-be-grassy fields with small yet maturing trees. As a park focused on history, it is first and foremost important to preserve the historic landscape when dealing with Nature. In this case, that means sustaining a grassy field ecosystem similar to 1864 conditions. By burning the field at this time of year, the heat from the fire penetrates the sapling top kills these young trees, thwarting off any intended growth. As we were systematically igniting various parts of the field (an effort to keep control of the fire), my particular role was to stay with the fire engine. I was in charge of the water—as you can guess, a crucial role to play. As the heat increased and the wind picked up throughout the day, so too did the nerves. The fire was growing. 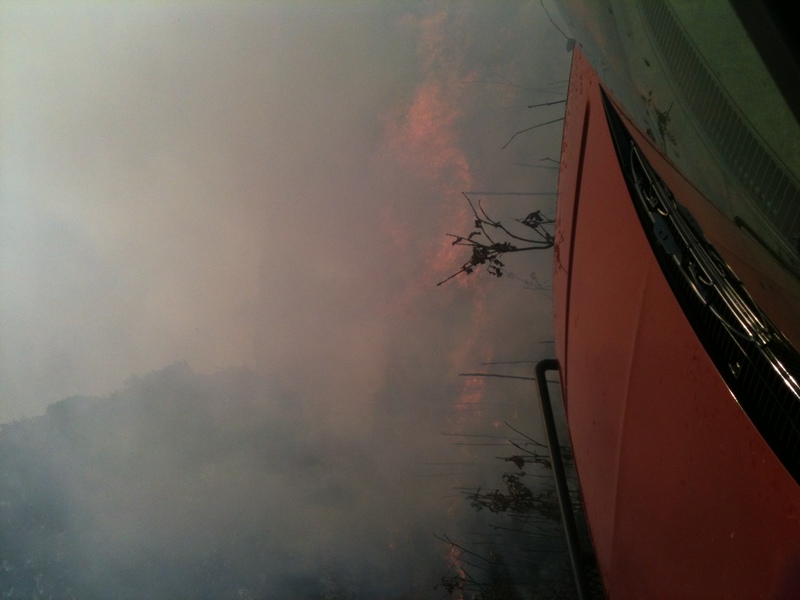 While in the engine, barreling towards areas in desperate need of water to control the fire, we found ourselves driving through flames and engulfed in billowing smoke. Instead of panicking, I instead could only imagine what it was like for soldiers on that field (as well as many others) nearly 150 years ago. The field was filled with smoke. The deafening sounds of the engine rumbling through the open field along with the crackling of the roaring fire filled our ears. Is this what it sounded like to a soldier so many years ago? Quickly realizing that my experience perhaps paled in comparison to that of a Civil War soldier, I did, however come to terms that this event did something remarkable for me that I will always walk away with. While attempting to restore the landscape in order to tell this important story to generations to come, I ended up getting to experience a taste of (literally) the heat of the moment at the Spotsylvania Bloody Angle. This entry was posted in Battlefields & Historic Places, National Park Service, Preservation. Bookmark the permalink. I went out on Saturday and had a look. Quite impressive. 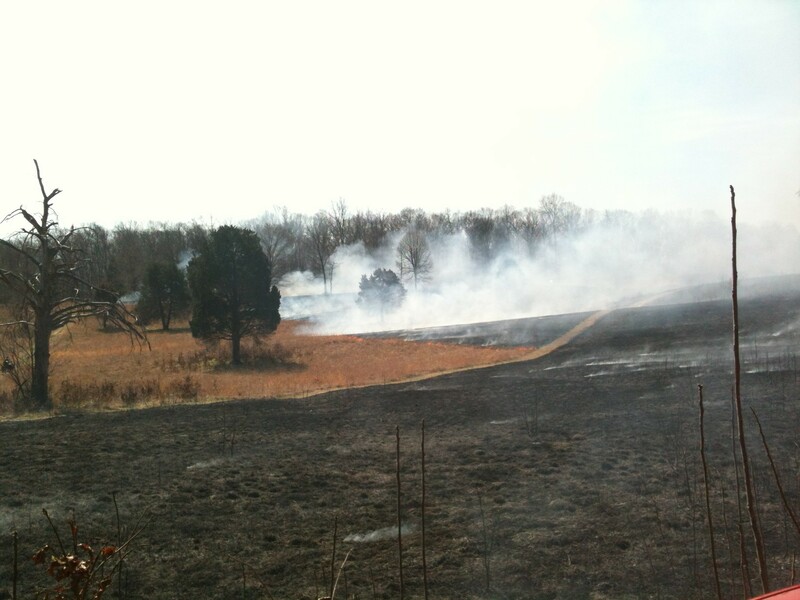 Especially the way they burned everything except the paths in the fields. Steve, it was fascinating to watch the fire crews be so systematic when lighting the field on fire. They were very deliberate about where and how certain areas were ignited which then allowed them to be intentionally dedicated to maintaining and putting out the fire. Pretty neat process to be a part of!